The Box Springs trail is a beautiful short trail high up on Mount Lemmon. It makes for such a perfect summer getaway I'm almost hesitant to post it. Beautiful deep forests, scenic views, and sweet swimming holes await the hiker who ventures out on this trail. Its short enough to be done as a dayhike, but the area is so nice that an overnight hike is recommended. From the Box Camp trailhead, head out on the Box Camp trail. This popular trail climbs up and over Spencer Peak, then drops down a drainage that is the head of Palisades Canyon. This area was only lightly touched by the Aspen Fire. You will see some aftermath from the fire, but it did not burn the trees' crowns in this area, and it has recovered nicely. Along the drainage at the head of Palisades Canyon, there are some beautiful meadows filled with maidenhair ferns. It is a pleasant and easy 1.8 miles along the Box Camp trail to the junction with the Box Springs trail. At this junction, turn right, or west, onto the Box Springs trail. This trail immediately drops down into a gorgeous little basin that is filled with some of the biggest coniferious trees I've seen in the Catalinas. The area underfoot is littered with pine needles and maidenhair ferns. This gorgeous little pine flat is the site of the old Box Camp, where the Knagge pack train would stop on its way between Soldier Camp and Summerhaven, back in the 1920's before the Catalina Highway was constructed. Box Camp was so named by early Tucsonan trail users, who would nail boxes to trees for temporary storage of the food and gear, on trips into the high country. Its easy to see why this beautiful site was selected. It would make a nice place to stop for a picnic, or even a super-easy overnight campsite for families with young kids. Proceeding onwards from Box Camp, the trail passes a boggy area near a spring, then climbs to a low saddle. 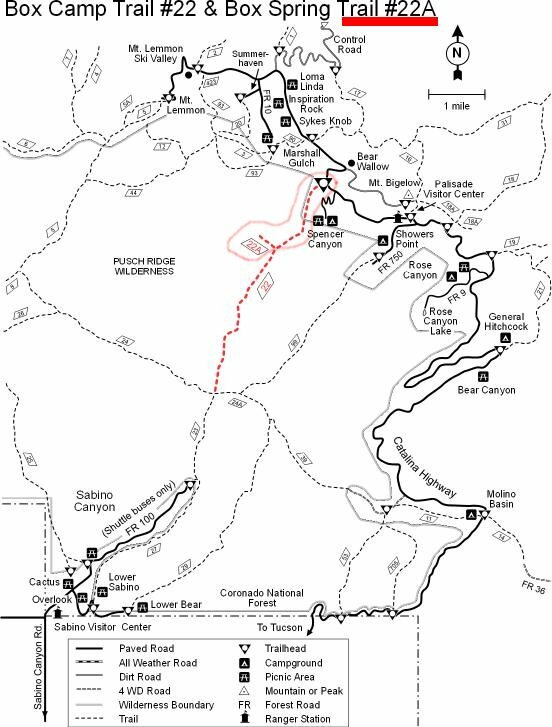 According to Cowgill and Glendening's "Santa Catalina Mountains" (the source for much of the info in this description), its possible to depart from this saddle southward and follow ridges cross-country 1.5 miles to Brinkley Point, one of the most scenic lookouts in the Sabino basin. I climbed up this ridge to have a look at this route, and found that the ridges on top had been deeply burnt by the recent fires, so the hiking had become much more arduous than before. I decided to drop back down to the saddle, as I was eager to get to Sabino Creek. From the saddle, the Box Springs trail proper switchbacks down to Sabino Creek, dropping approximately 800 feet in .7 miles. Unlike the areas before this though, this section of the trail was deeply scarred by the Aspen Fire. The fire burnt right through the crowns of the trees, and as a result, prickly bushes have run riot along the steep slopes dropping down to Sabino Creek. The trail itself has been obliterated. There are a number of small drainages dropping down the slope, however, and these are much less brushy. So I recommend that the hiker simply pick a drainage and start heading down. There will be loose slopes of dirt and scree to negotiate, as well as easy scrambles over small pouroffs within the drainages. Near the bottom, the drainages converge, and meet Sabino Creek. Just above the creek is a large boilerplate sign marking the end of the Box Springs trail. The forest on either side of the creek was spared by the fire, so there are some nice shady campsites to be had. The sign warns that Sabino Creek is polluted due to runoff from the Summerhaven area. I drank the water (purified) and survived, but it will be up to each hiker to make their decision on this matter. Just below the Box Springs trailend, Sabino Creek enters a major box, one of five that sit along the creek between Marshall Gulch and Hutch's Pool. Once you've got your camp set up, head down the creek and you will quickly come to this box. Reaching the pools is a bit of a struggle. The most obvious route is to scramble up the rock slope to creek right, then drop back down below the pools and work your way up. With a bit of exploration though, you may find another way to go. As you head down into the box, you will notice a small ledge on creek right that you can easily scramble down to. When I climbed onto this ledge, I found a little concealed cave that I could wedge my way through to reach the other side of the creek. It was then an easy drop from this cave into the slot and swimming hole on creek left. However you reach the box, take your time to enjoy it. There are several beautiful waterfalls, a genuine slot that is deep enough to swim through, and a natural waterslide to enjoy. There are two options for return routes. The book mentioned above states that it is possible to head up Sabino Creek, through another box, to its junction with Bear Wallow Creek. One would then bushwhack up Bear Wallow Creek to a spot along the Catalina Highway not far from the Box Camp trailhead. I originally planned to follow this route, however the number of mosquitoes along the creek dissuaded me. I chose the easier second option, to simply turn around and head back the way I came, for a total trip of 5.4 miles. 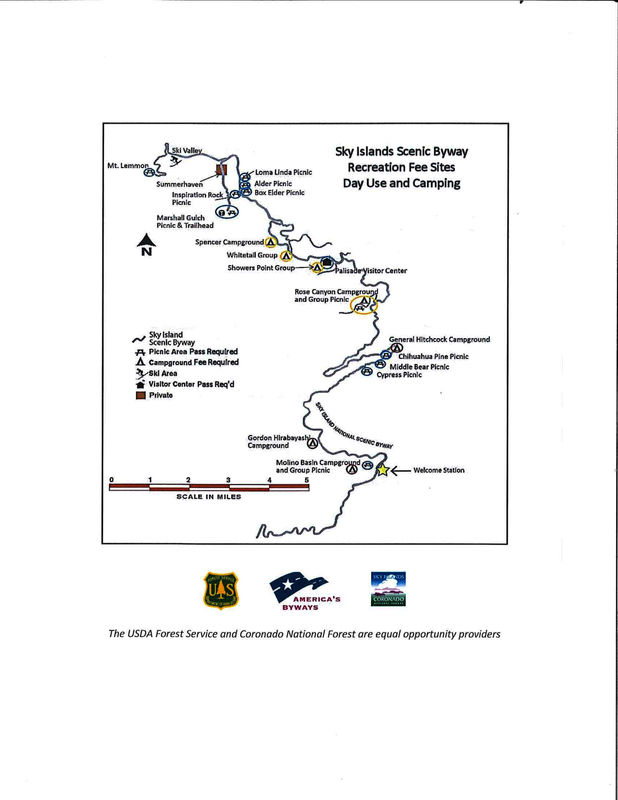 There are four specific day use areas that require a Coronado Recreational Pass or a National Pass/America the Beautiful Pass. 4) Mt. Lemmon at 11 day use sites. Catalina State Park $6 per day. Sabino Canyon Tram is $10 extra. 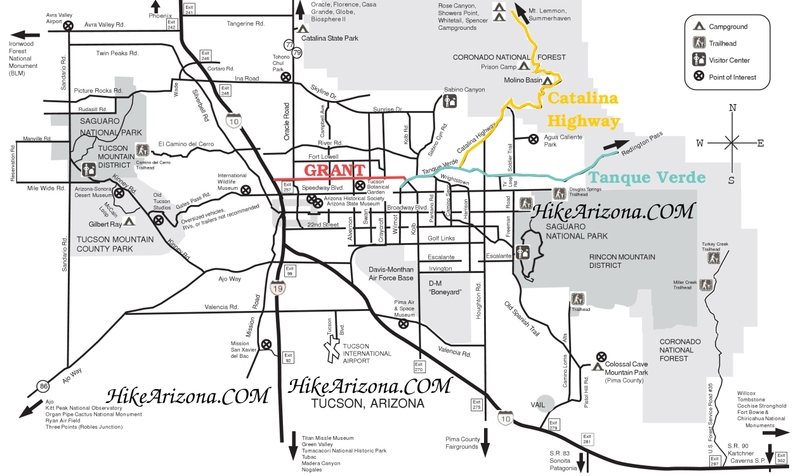 From Tucson, drive east on Tanque Verde Road to Catalina Highway. Turn left on Catalina Highway (the only way you can go) and follow it into the Santa Catalina Mountains for nearly 30 miles. The trailhead is just after milepost 21 on the Catalina Highway, and just beyond the Spencer Canyon Campground.